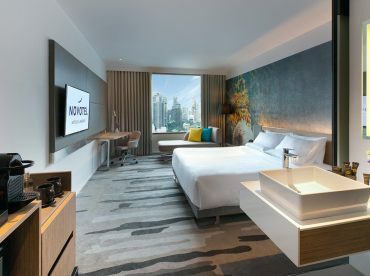 Grand Deluxe room offers a 6-feet King-sized bed with the modern Novotel N’Room design. The design concept is simple, sleek, and functional, with Smart Pillow, natural lighting, and city views. Decorative wall art illustrates Thai unique way of life. Special features in Grand Deluxe include a spacious bathroom with sliding door, Bluetooth speakers, and Nespresso machine. Only 18 Grand Deluxe rooms are available for booking.